Retrouvez votre guide en face du Monument Gediminas sur la place de la Cathédrale, situé dans la Vieille Ville. Votre excursion se concentrera sur l’histoire de Vilnius, une région qui s’est développée pendant l’époque soviétique. Passez à côté du Pont Vert, le Planétarium, la place Lukiskiu et l’ancien siège du KGB. Pendant que vous avancez, écoutez l’histoire des espions du KGB, et vous en apprendrez plus sur le rôle qu’a joué le basket-ball dans l’indépendance de la Lituanie et la manière dont la Lituanie et Vilnius ont été intégrées à l'URSS. 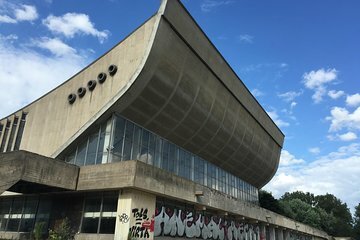 Vous ferez également une halte pour voir les bâtiments les plus emblématiques de l’ère soviétique, tels que l’ancien Palais de Concerts et de Sport, l’Opéra et le Théâtre et la Maison de Scientifiques. Votre excursion se terminera sur la place Kudirkos, à 5 minutes à pied de votre point de départ. Lukas was an outstanding guide who knew the history of Soviet Vilnius very well. His tour was well paced and expertly organized. If you want to know about this part of the history of Vilnius, and you should, I highly recommend this intelligent young man. Our guide, Ieva, was an expert in her field, very knowledgeable, and with a great command of English. She added personal experiences of her family as well as pictures of the troubled times prior to 1991. Highly recommended if your are interested in learning about life under Soviet rule and Lithuania's struggle for independence. Our guide covered alot of ground. We saw many monuments and buildings. The guide had grown up in the Soviet area so recounted some of his experiences. It was also a good way to see some parts of the city you might otherwise miss. I highly recommend the tour. Very good tour with an interesting guide. Eva was a fantastic guide and got a lot out of her program. Due to the very small nature of the group, her presentation was very interactive conversational like vs. a straight lecture. Our guide Milda is very energetic, fun and wit. She displayed a deep knowledge about different history,architecture and politics of the era. She provided accurate yet entertaining descriptions of a bygone era, making us see Vilnius through her eyes. I highly recommend this tour. had an amazing time in vilnius and a great tour of the city our guide Martine did a suburb job. she was very knowledgeable and a great outlook on life and demonstrated a great attitude through out the tour. Lithuanians she really did you proud. It was an amazing tour... The guide was at a high knowledge level and was able to give to every question a clear answer. Further the guide provided us with pictures about the sights of former times on an Ipad which was also very good to get an imagination about how it was in former times. The walk by feet was not to far and absolutly able to walk. I got more impressions on that tour than I have suggested. Definitvly I recommend you this tour!!! The tour was really great! The guide explained lots of the older buildings in Vilnius and put them in historical context. He also answered loads of my questions and recommended really interesting books about Lithuania as well as restaurants and places to go.